When I go to bed at night one of the things I do is check my Nordstrom wishlist. I always put things on there and check back for when it goes on sale. So I was pretty surprised to wake up yesterday morning and find all these items were 50% off! That's an awesome sale. Weirdly it's only girl stuff though...so apologies to boy moms everywhere. 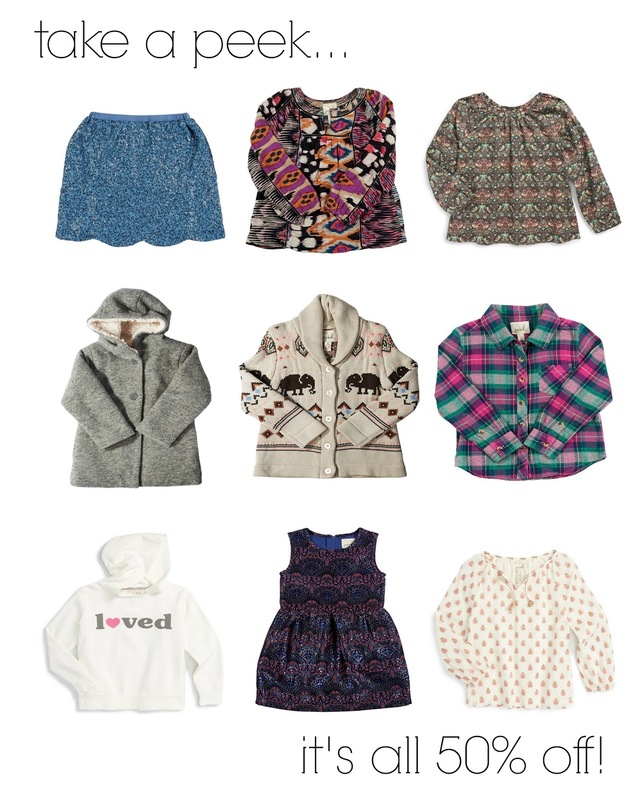 I snatched up the geo print tunic and the loved sweatshirt but all these things are so adorable. Would make great presents too! I mean what Elsa loving girl is not going to love that blue sequin skirt - don't "let it go" if you know what I mean! Did you get anything? Spill! I went and looked again this morning and even more is on sale! Check out this adorable sweater (baby size here) for your little man, these cute fair isle print leggings and this shimmer metallic dress! Click here for all the sale pieces! I love checking my Nordstrom wish list for markdowns! These picks are adorable. That dress in the last row— so cute! That Elephant Shawl Sweater is adorable! I never remember Nordstrom because we don't have any close around here! Thank goodness for online shopping. That geo print tunic is darling!!!! I'm convinced that girl clothes are just 100x cuter than boy clothes! These are all adorable.